AT&T To Buy Time Warner For $85 Billion It emerged Saturday that AT&T is set to buy Time Warner for about $85 billion. If approved by federal regulators, the merger would create a mammoth media and telecommunications company. It emerged Saturday that AT&T is set to buy Time Warner for about $85 billion. If approved by federal regulators, the merger would create a mammoth media and telecommunications company. We're going to start the program today with a major business story. One of the biggest media mergers in years could be announced this evening. NPR has confirmed that AT&T has agreed to buy Time Warner for $85 billion. The boards of the companies met this afternoon to approve the deal. The merger takes place at a time when consumers' viewing habits are rapidly changing and major media companies are struggling to adapt. We're joined now by NPR's Jim Zarroli. Jim, thanks for joining us. MARTIN: So these are two iconic American companies. Can you just remind us about what each of them does today? ZARROLI: Yeah, well, start with AT&T. This is not the company that everybody used to think about when we talked about the phone company. That company was broken up in the '80s into seven companies. One of those seven was Southwestern Bell, which later, after a bunch of mergers, took on the brand name AT&T. And that is the company that's doing this deal. It's a major wireless internet company, has millions of subscribers. It also owns the satellite company DirecTV. Now, Time Warner - Time Warner is really a content company today. It does movies and TV programs. It owns HBO and CNN and Warner Bros. studios. It used to be in the cable business, but it got out of that. Today it's largely a content provider. MARTIN: So who initiated the merger, and why do these two companies want to merge? What do they hope to accomplish? ZARROLI: Well, this is really a marriage of content and distribution. AT&T right now has access to, you know, millions of consumers because it sells internet and wireless and satellite service. Buying Time Warner means it also will have access to content that those customers want to see. You know, buying Time Warner means buying "Harry Potter" and "Game Of Thrones" and, you know, just lots of programs that customers want to see. So that could be a real advantage for AT&T going forward in terms of just holding on to and attracting customers. MARTIN: Well, how do we think that AT&T would want to use the content that it acquires by buying Time Warner? ZARROLI: You know, we don't know because I think the media business is changing so much. And people are giving up cable and they're watching programming on their smartphones and their digital devices. Young people in particular just have very different viewing habits. And in the past few years, there's just been this scrambling by media companies to figure out how to respond. I mean, you saw Comcast and NBCUniversal merge. You saw Time Warner get rid of its cable. So there's really no guarantee this is going to work. I mean, you just need to go back to the merger of AOL and Time Warner 16 years ago. I mean, at the time, that was just said to be this merger that would fundamentally reshape the media landscape, and it turned out to be a big disaster. I think the lesson is it can be hard for big media companies to get out in front of the changes that are taking place sometimes. MARTIN: Well, we've already heard what - at least one major figure, Donald Trump, object to this deal. Can you just tell us a little bit about what the objections are that will be or likely will be raised to this? And the deal isn't supposed to take place until late next year. If it is approved, why will it take so long? ZARROLI: Because these deals always have to go through, you know, regulatory scrutiny. In this case, there are reasons to think the government is really going to look at this one carefully. There are a lot of people who think that regulators should have asked more questions before approving the merger of Comcast and NBCUniversal. In that case you had, you know, this same kind of thing, a major cable and internet company merging with a content provider. So a lot of people think that the government should have been tougher. And I think just the atmosphere in general for these kinds of big mergers is changing. People are a lot more skeptical of them. MARTIN: Thanks, Jim. That's NPR's Jim Zarroli. Jim, thank you. Time Warner is heading for another merger — this time with AT&T, in a deal that was announced Saturday. Here, the company's headquarters at New York City's Columbus Circle. 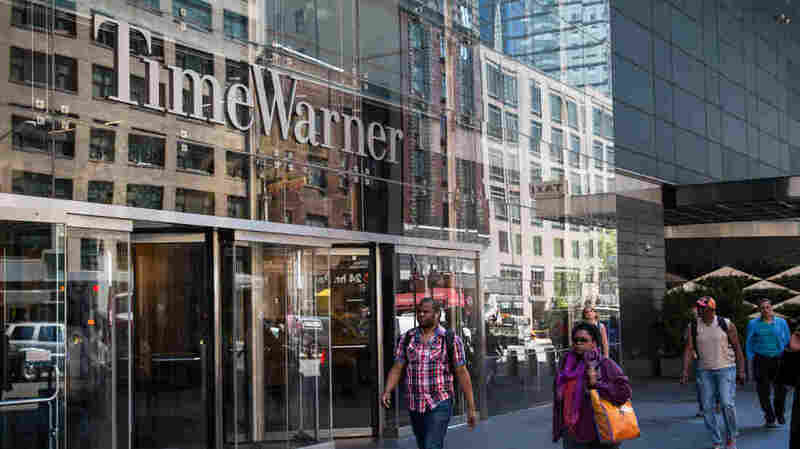 AT&T has announced it's buying Time-Warner in a cash-and-stock deal worth more than $85 billion, uniting one of the country's largest communications companies with a major content provider. The deal was formally approved by the boards of both companies on Saturday. "This is a perfect match of two companies with complementary strengths who can bring a fresh approach to how the media and communications industry works for customers, content creators, distributors and advertisers," said AT&T CEO Randall Stephenson, who will head the new company, in a statement. "It's a great fit, and it creates immediate and long-term value for our shareholders." Dallas-based AT&T will pay $107.50 for each share of Time-Warner stock. AT&T is a major provider of internet, wireless and telecommunications services to millions of people. By acquiring Time-Warner, owner of CNN, HBO and Warner Bros. studios, it will have access to a vast library of content that includes the Harry Potter franchise and "Game of Thrones." The merger comes at a time when consumers--especially young ones--are increasingly eschewing cable TV and watching programming on their smartphones and wireless devices. "The new company will deliver what customers want — enhanced access to premium content on all their devices, new choices for mobile and streaming video services and a stronger competitive alternative to cable TV companies," the statement said. AT&T is anxious to find new sources of revenue in part because its other businesses, such as wireless, aren't growing the way they once did. "AT&T faces a tough 2017. While competition is generally tame within the wireless industry, many believe the dominant operators are about to enter a prolonged phase of share donation to Sprint and T-Mobile," wrote Walter Piecyk of the research firm BTIG. This isn't the first time Time-Warner was part of a historic media merger. In 2000 it was acquired by AOL, in a deal that promised to fundamentally transform the media landscape but turned into one of the biggest disasters in corporate history (from 2003: AOL Posts Record $99-Billion Loss). The size and scope of the AT&T deal, which has to be approved by the Justice Department, is already raising eyebrows in Washington. "Such a massive consolidation in this industry requires rigorous evaluation and serious scrutiny," said U.S. Senator Richard Blumenthal. "I will be looking closely at what this merger means for consumers and their pocketbooks." On the campaign trail Saturday, Republican presidential nominee Donald Trump said he would block the deal if he wins the election.